End of BotCon in San Diego, California. No word or hint at where the next one would be. 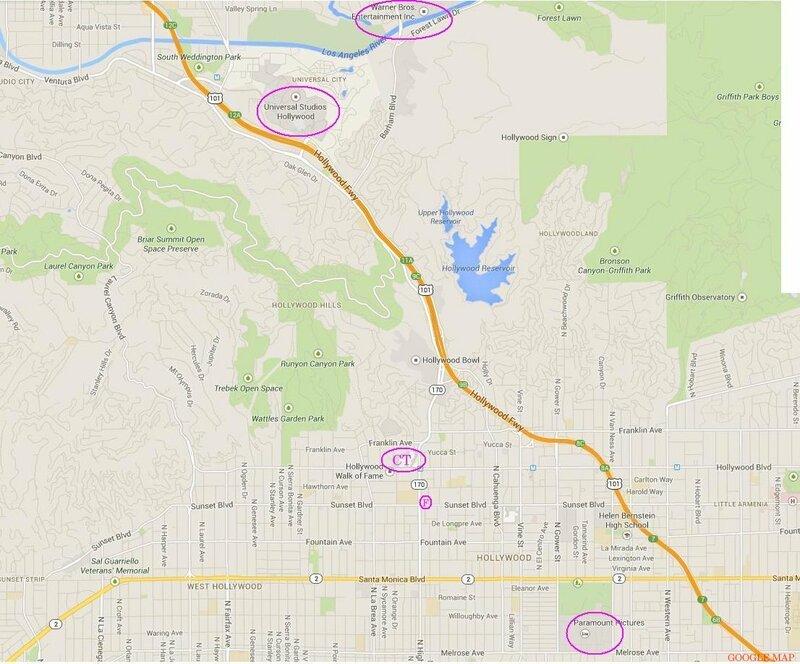 Location and date is leaked as being at Pasadena again in June 2014, from someone who found a listing at the Convention Centre. People rush in to book rooms at the Sheraton, booking out the entire hotel within 3 days. October issue of the Club Magazine says that the location and date will be revealed in the next issue. December issue of the Club Magazine doesn't give details, but says that they are now locked in, to be revealed shortly on their site. Dates and location officially announced, matching what was leaked 2 & 1/2 months ago. The Sheraton is announced as having discount rooms, but the three days of the Convention was booked out months ago as well. 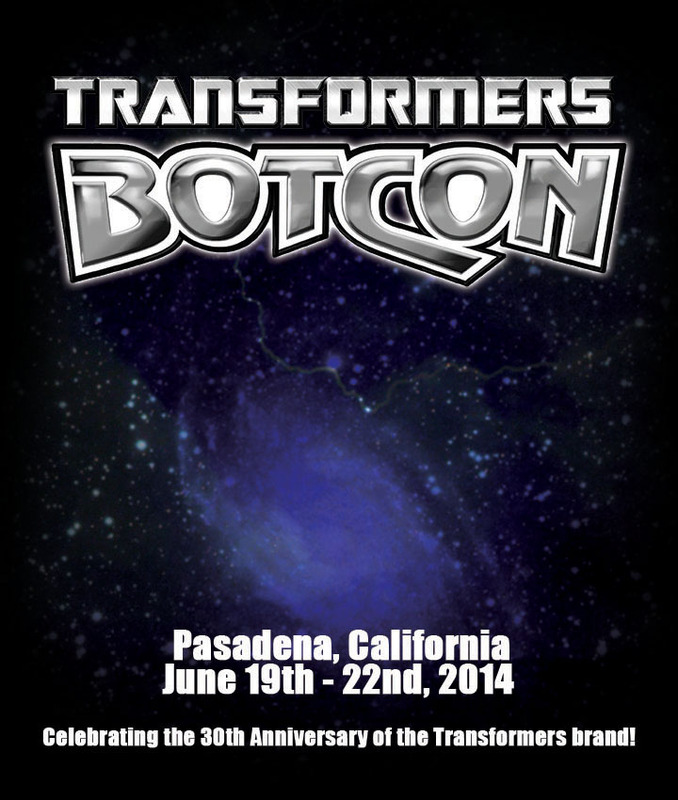 The early advertising banner for BotCon 2014. For some bizarre reason it only promotes the one thing that wasn't included in the theme and toys this year, so it was one promotional claim that they weren't able to back up later. A Texas convention announces having a convention on the same week as BotCon, with several Gen1 voice actors as guests... preventing us from expecting any at BotCon. 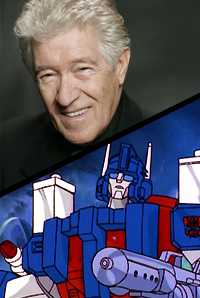 People at the Texas convention - Peter Cullen (Optimus, Ironhide) Gregg Berger (Grimlock, Long Haul, Outback, Jetfire), Neil Ross (Bonecrusher, Hook, Springer, Slag), Alan Oppenheimer (Warpath, Beachcomber, Seaspray), and Michael Bell (Prowl, Sideswipe, Scrapper, Swoop). A pirate theme for this year is announced by FunPub. It attracted a fair bit of criticism for marketing a new concept first this year, instead of at least marketing some sort of connection to commemorating the anniversary to gain the support of the fandom before unveiling their Pirates. 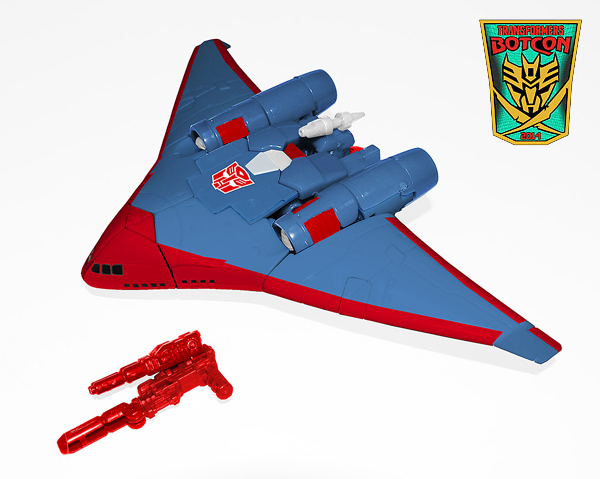 In the end, the primary focus of the toys and theme would be pirates and knights, with the secondary focus being a commemoration of the anniversary of BotCon... no element of the Brand's 30th anniversary at all. 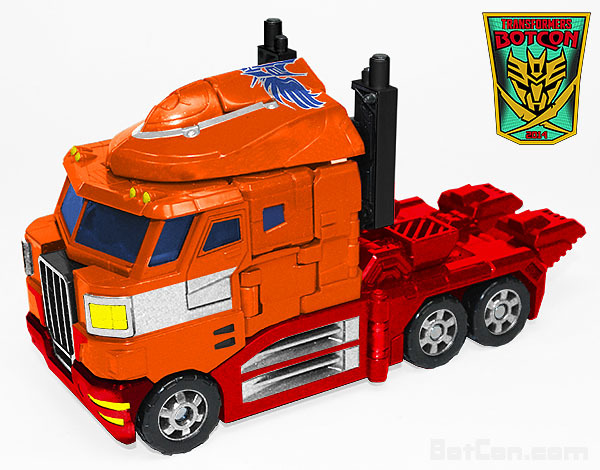 They should at least have started with something that had a better chance of keeping people on-side, like starting with promoting the anniversary of BotCon first, and then push the pirate and knights on fans expecting an anniversary. 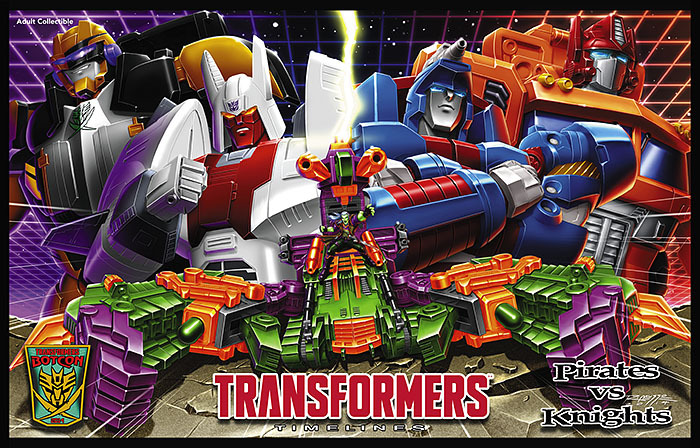 Ultimately, a banner on the website saying it was the 30th Anniversary of Transformers was all we ended up getting from the "Official Transformers Convention". The full theme is unveiled - Pirates Vs Knights. Plus the Hilton is announced as a second discount hotel. It's US$139 plus tax (about $23.50)... plus $10 per night for internet. Deposit of one night required. I'm still yet to commit myself to going this year. I probably will go, but am not as excited this time, as I'm really disappointed that they wasted an anniversary by having a pirate & knight theme this year. 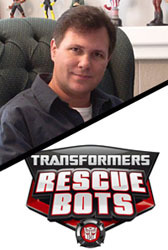 Pete from BotCon responds to questions about if they are all pirates and knights this year. Apparently the February issue of the Club Magazine has revealed the first figure... Cannonball, but foreign fans who wait an extra 3 weeks for the magazine, only learn this from comments of Americans on fansites. 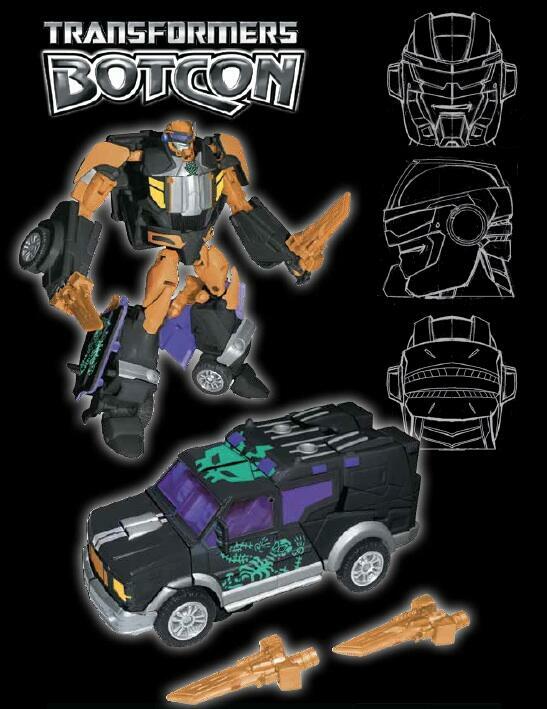 Images were later put up on the BotCon website. The Toy comes with a new head, and is noted by FunPub as being the only TFPrime mould in the boxset (but not necessarily the only one of all this years toys). 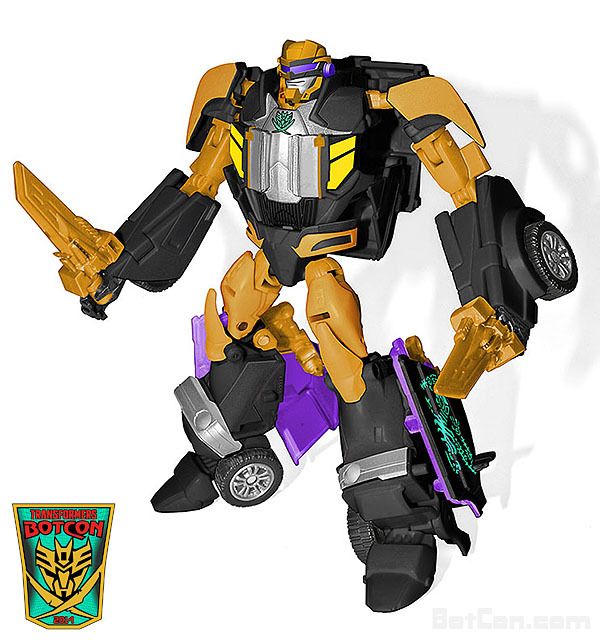 (quote) The very first toy explored for Cannonball was Breakdown. Because on the face of it, it seems perfect. They kept pushing all this non-commemorative stuff, knowing full well that fans were dying to see something commemorative for this year to get excited about - why risk criticism on something unrelated, when you could easily win back the fans by teasing something even remotely commemorative. Good marketing gets your foot in the door with something they want, then push the products they wouldn't have opened the door for. After much deliberating, I finally commit to the convention by booking flights for just seven nights in Los Angeles (the minimum time for convention and pre-Con toyhunting). I ended up deciding against going anywhere else or doing much, which was why it was just the minimum amount of time. I was even planning to just do six nights (leave Sunday night after the convention like in 2011), but just in case I was on my own and there was something special on the Sunday again, I decided that it would be best to waste a whole extra day (Monday). I manage to get direct QANTAS flights each way, reducing the amount of time (and tiredness) on each direction. The Return flights cost AU$1,829, and Insurance was AU$147, making it just under two thousand dollars. Plus, it came with a $150 voucher for use on selected tours, hotels or hire car. I was not planning to get a hire car, and it was still too early to know what tours or hotel I was going to end up in, so fortunately I had until the end of April to use the voucher. I just had to hope that the pre-registration happened before then, or at the very least, the Brochure, so that I could best guess what to use the voucher on (so that it doesn't end up paying for something included in the Convention, or wasted on something that I can't end up using). 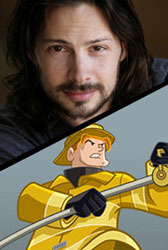 A surprise, considering the bulk of living major Gen1 VAs are at a Texas convention during this weekend. 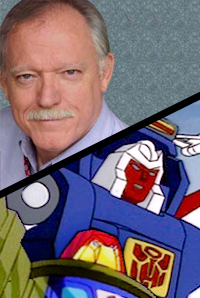 A fourth guest has been announced - Jack Angel.... the voice of Gen1 Astrotrain, Ramjet, Omega Supreme, Smokescreen, Breakdown and post-Movie Ultra Magnus. 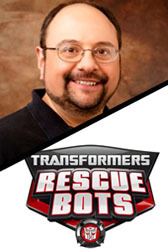 This will be his first BotCon, and like many of the original series voice actors, he's getting on in his years, so it will be good to finally get him as a guest.... after a late cancellation for BotCon 2011 due to health reasons. 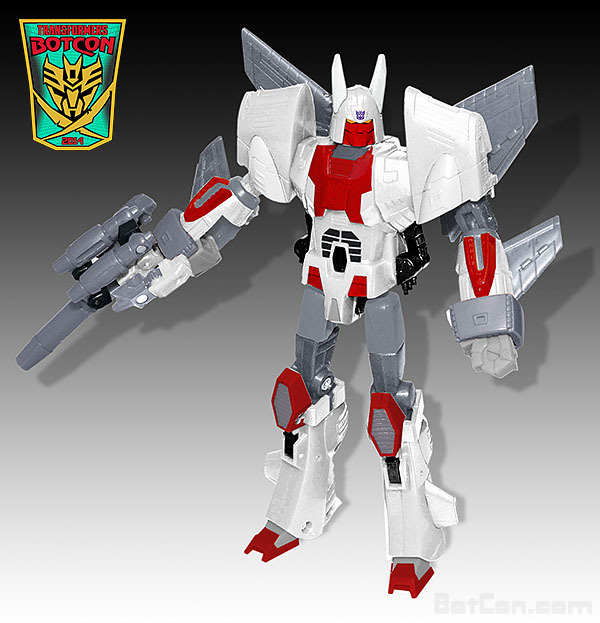 The second boxset figure is revealed - Ferak, with a Targetmaster gun called Tornado. 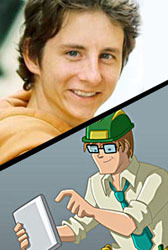 Ferak was a character that appeared VERY briefly in the original series comic, and also VERY briefly in IDWs Last Stand of the Wreckers comic. 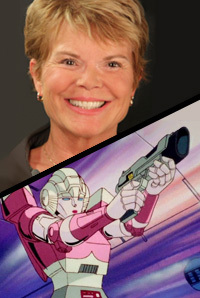 Another Gen1 VA guest is announced - Samantha Newark, who voiced Ariel (but not Elita-1 whom she became, after events in War Dawn). 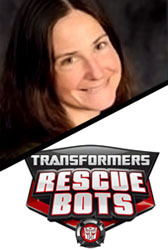 Looks like she did some other minor female voice parts in the TFs cartoon, but her total contribution was so minor compared to other Voice Actors from Gen1, it wasn't even on my list of possible Voice Actor guests. I'll be surprised if she remembers anything at all... or if she will talk more about being the role of Jem in that cartoon instead. 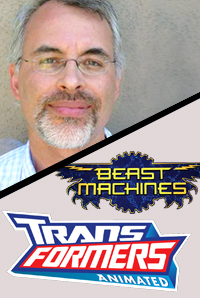 Another 2 guests have been revealed on the Botcon Website - Derrick J. Wyatt and Marty Isenberg, who both worked on the Animated series, and Marty also worked on Beast Machines. The third figure, Devcon is revealed. The toy comes with a new head. 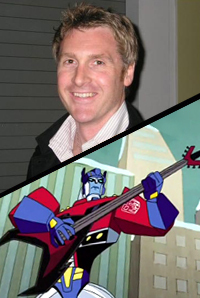 David Kaye is this week's announced guest. 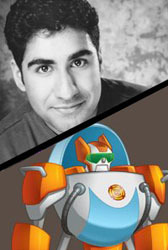 For those unfamiliar, he is best known for voicing Beast Wars Megatron, but also Animated Optimus and Armada/Energon/Cybertron Megatron, as well as a small role on TFPrime (as Hardshell). 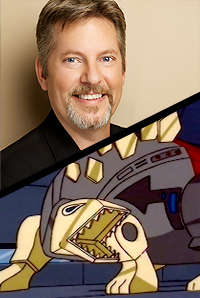 This guest helps FunPub get "30 years of (Voice Actor) guests", if they were aiming to have at least one "30th Anniversary" element to the convention this year. 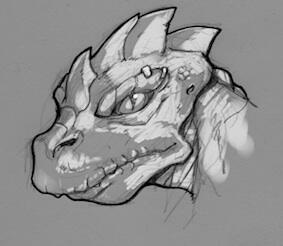 A tweet is sent out of a sketch of a humanoid called Olin. It is apparently the Nebulan head of Scorponok, but the name isn't in the bio or comic - only Zarak is mentioned in the comic. According to TFWiki, the Gen1 character of Zarak was retconned by IDW to make "Zarak" his last name, giving him "Mo" as his first name. FunPub then created Olin Zarak as his son for their universe. 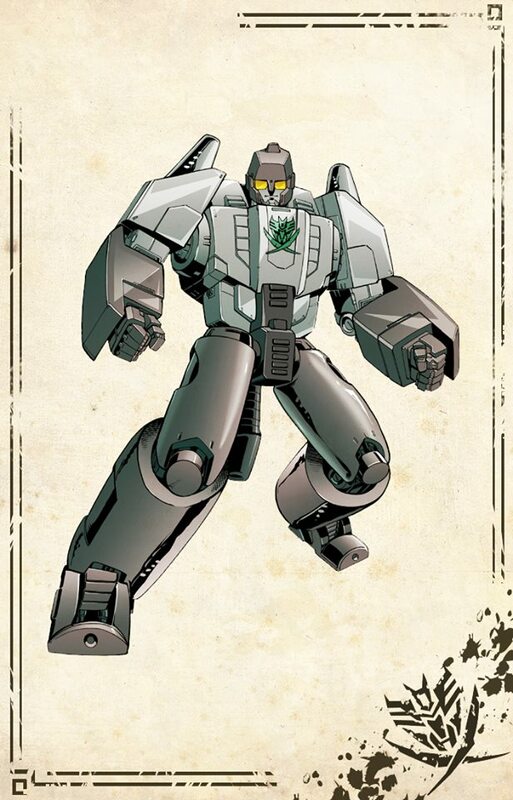 Even though Zarak had a daughter in the Gen1 comic, the BotCon comic follows the Cartoon universe, so any relative can be added because none were known in that universe. 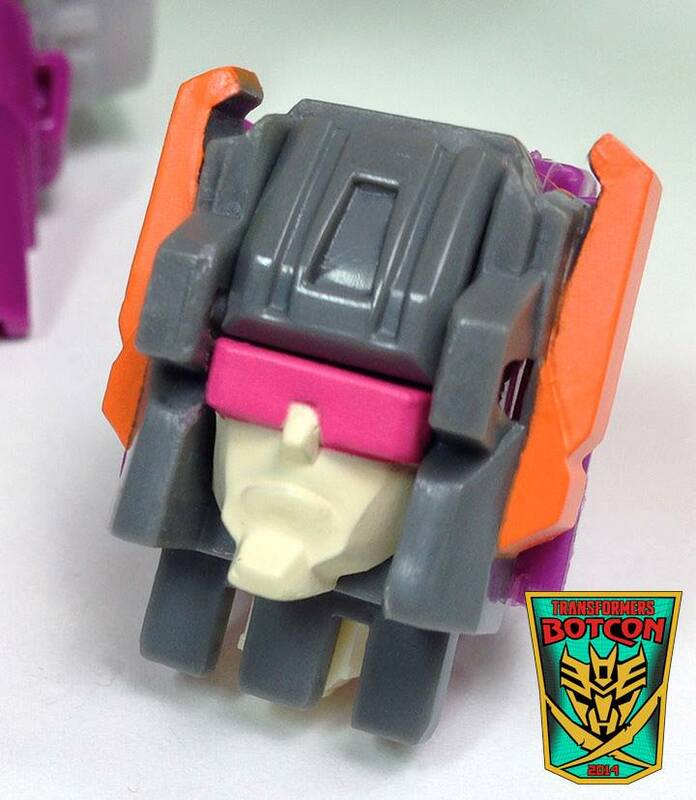 The fourth figure of the boxset is revealed - Scorponok, re-using the Energon Scorponok mould, with a modification to allow a headmaster head to plug in. 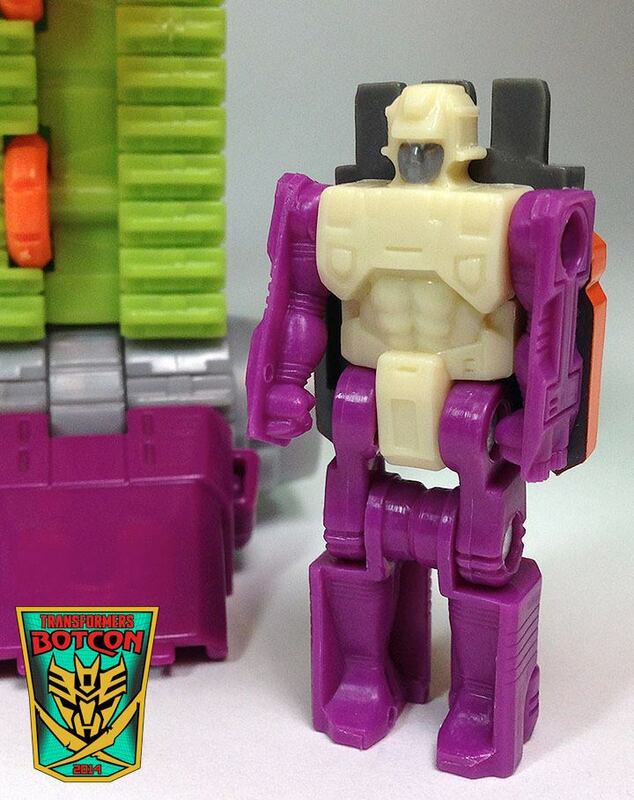 They ended up doing the Headmaster gimmick in a way that I was originally thinking was possible - plugging an existing Headmaster head into something that was essentially a "remoulded" head (a base-plate in place of the original head of the toy). 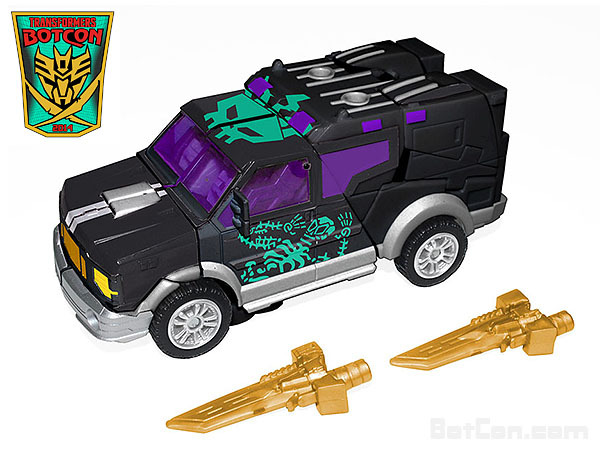 The wording on the site says that it is the Reissue Spike that has been remoulded into a Scorponok head (since the Fort Max mould is recent, making the Head component available)... but not remoulded into just Zarak, because on the original toy he did not form the entire Scorponok head. 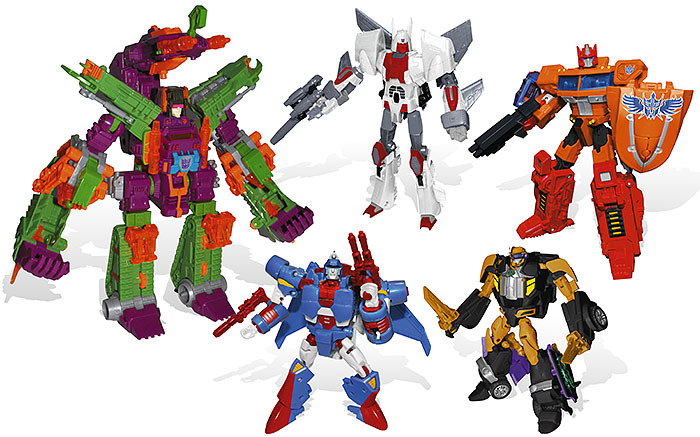 If this set now includes Devcon and Scorponok, then maybe the story this year is set somewhere in the Gen1 cartoon universe like some of their previous Club/BotCon stories. It will be interesting to see if this has helped turn the tide towards registering to attend, from just buying non-attendee sets, or just pre-ordering from online stores. I think the first day of pre-registration will give us an idea of if this really has pushed enough people into attending, just to secure these figures... as FunPub will reduce the number of non-attending sets (which would include those online stores) if they actually sell at least 75% off the attending sets on the first day (sales drop off significantly after 24 hours). Last year they only got 30% sold in the first day, and kept moving stock to the non-attendee pile, and still didn't sell out throughout the entire convention. I think the pirates and knights theme is still putting people off... which should have been a sub-title to a big bold 1984 Transformers logo on a glossy black Box lid. Then it would have been accepted more easily by those looking for an anniversary homage set. If the fifth figure is any good, it will help as well, but their policy of not announcing any of the at-show toys, means they can only promote a third of the toys, and just hope people will take a blind jump at committing themselves to about US$700 for all 14 toys... and the recent few years haven't made that a worthwhile risk. 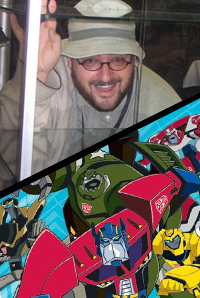 Next guest announced - IDW writer James Roberts. Since we are back in California, expect most of IDW's writers, artists and editors to be at BotCon... a fan convention is where you'd want to meet them, so it is a good idea to have as many as they can get. The question will be if they have an IDW tour again this year, being about three hours from Pasadena. 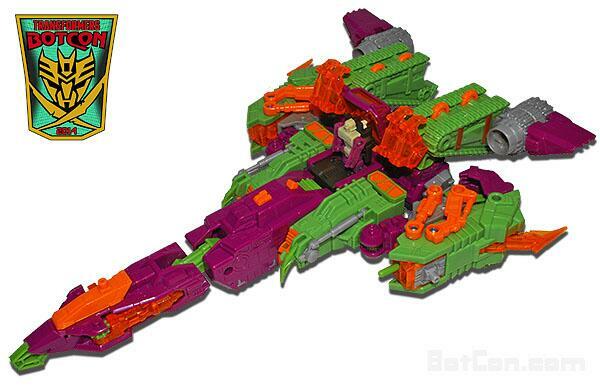 Jet mode of Scorponok is revealed. The GIJoe Con was on this weekend, so things are usually put on hold for a couple weeks... which they should have communicated to their Transformers followers, considering the tight schedule of BotCon info at the moment. Or at the very least, have a series of updates or tweets ready to send out at regular intervals so that it doesn't look like something is wrong from the radio silence (considering their past, it's easy for fans to assume the worst when we hear nothing from them). 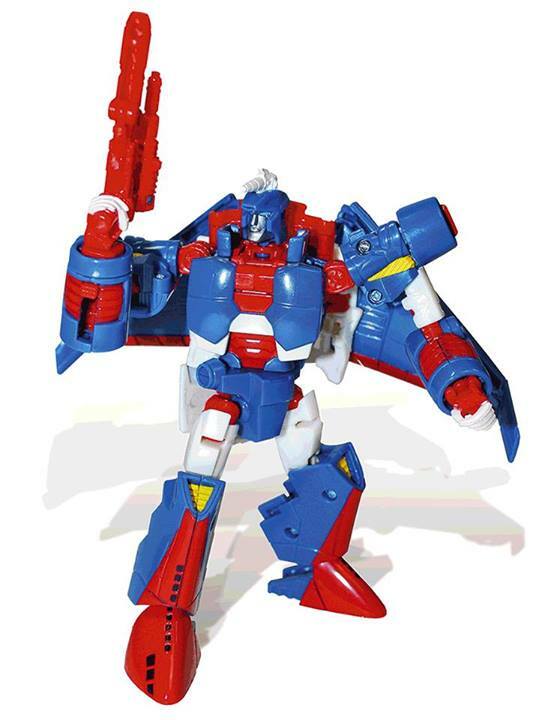 The fifth and final figure of the boxset is revealed, Ginrai (the inner robot of the Fire Guts God Ginrai released by Ehobby about 10 years ago). This one is part of the "knights", and creatively uses the wind deflector (gun) as a shield (adjusting the arm panel so that the fist folds down for the post to plug in like TFPrime Breakdown's hammer). The Fire Guts God Ginrai concept was released by Hasbro as a PVC figurine, called Apex Armor Powermaster Optimus... so it will be interesting to see if FunPub follow the Japanese version (the robot is a non-sentient construct used by a human) or exist like the Hasbro Powermaster concept (a sentient robot that uses a human to help power it). I really hope that pre-registrations starts soon, as it is only 2 months away.... making it REALLY last minute again. A group shot of the boxset figures (photoshop versions). The full flyer image, with the Pirates and Knights logos (which coincedentally matched the Decepticon and Autobot allegiances of each character - there were no Autobot Pirates or Decepticon Knights). 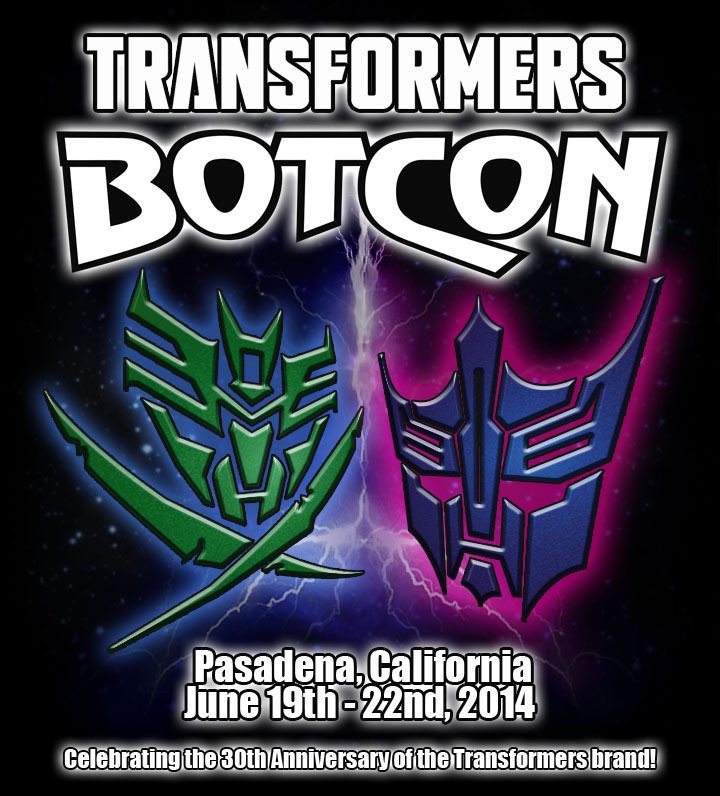 Sorry this has taken so long to get to you but the BotCon 2014 brochure is finally online at BotCon.com. We have been waiting on the final details for the TRANSFORMERS FAN EXPERIENCE at Universal Studios Hollywood, and we got the green light today! 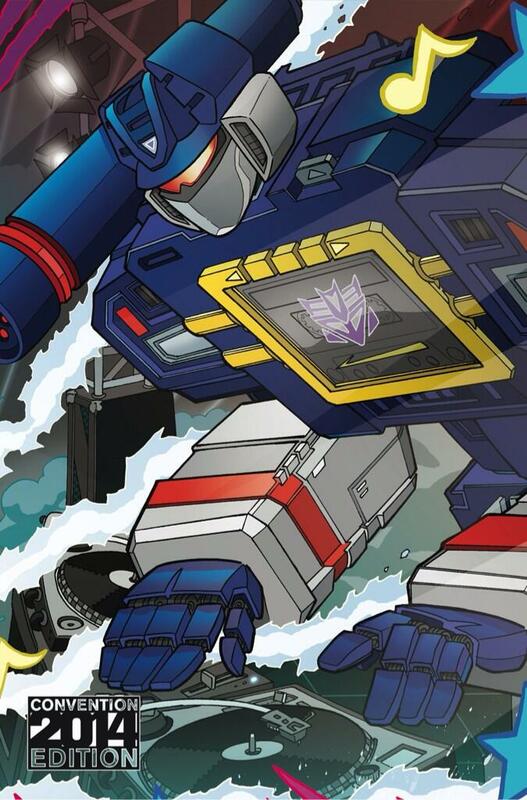 This will be a fantastic event at this year's 30th Anniversary Transformers Celebration! Don't miss it! - Fan experience at Universal Studios Friday Afternoon... and it is an included feature, not an add-on that could end up being mis-handled. - The Fan Experience is access the Universal Studios for about 5 hours into the night (including 3 hours after it closes at 8pm that day, just for us fans to have exclusive run of the place). - The Custom Class figure will again be available to purchase, to prevent people from taking up valuable spots in the Custom Classes who only want to sell their figure. It is more important to allow those who want to experience the fun of constructing their toys and custom painting them, and who value them too much to ever want to sell it. - Four classes of 60, making it 240 places. That should help keep availability open for the first few days of pre-registration, and not sell out in the first 10 minutes to the lucky few (who mostly resell their figure for profit). - The pre-Con tour to Six Flags Rollercoaster park is one I'm not too interested in, so if I can get into the Wednesday Custom Class, I won't be upset about missing out on one of the Pre-Con tours. 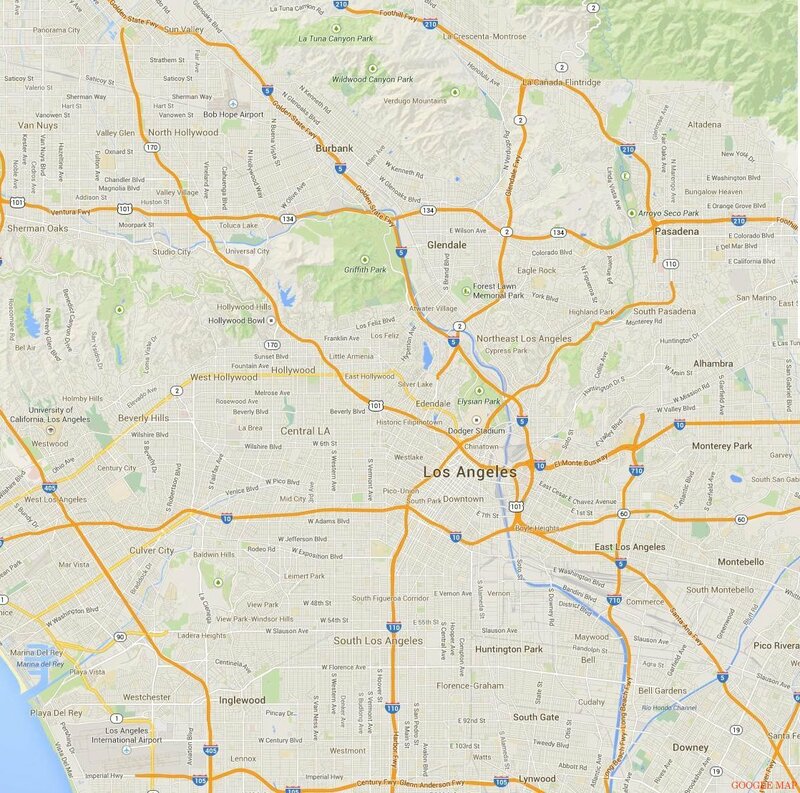 - The LA Tour on Thursday is significantly different to the Tour in 2007, and includes some LA locations I have been interested in checking out in the past (CityHall, Union Station, Sunset Strip, Disney Hall, Griffith Park Observatory (a scene in the first TFs movie was filmed there), and the Santa Monica Pier). - No real emphasis on this being a "30th Anniversary Celebration of the Brand". There were a couple of mentions of the figure over the five pages of the brochure, but the greater focus is still mostly on the Pirates & Knights... when it should be the other way around (saying something like, "Celebrating 30 years of Transformers, featuring Knights & Pirates" instead of saying "a whole new theme while also celebrating 30 years of the Transformers"). - Full registration (Primus Package) goes up another $30 ($395 this year), while the non-member set goes up $45 ($495 this year, now making it cheaper to buy any membership first, even the foreign membership - it is always odd that they have that other price in the past, but now it is obviously a way to boost membership, as ALL non-attendees buying a set will be forced to be a member if they want save money and get a bonus toy as a member... and it increases the number of potential customers who will now be able to order direct any exclusives & Subscription figures at prices less than secondary sources like BBTS). The other problem with a redundant non-member price is that it sometimes over-charges members when there is a glitch between the two websites (logging in to the club site and registering for BotCon). - Less than half loose sets this year, down from 550 last year to 250 this year. I wonder why there is such a small number this time... and will that make it more likely to sell out fast this year because of people wanting to re-sell Scorponok at a premium. - the same number of Golden Tickets as last year, which might be in greater demand this year, despite a perceived downturn in support for FunPub (the boxset, guests and "fan experience" may have offset that downturn). I don't like the "elitist" element of the GT, or the opportunity for FunPub to make an extra $30,000 for just one extra expense on their part (a Saturday night reception with most of the main guests)... but for the things I have to do at BotCon (cover the news, bring back as many at-show toys as time allows, meet the main guests without missing Panels), this is a welcomed feature for me (and in turn, you guys who read the news and get the toys through me). - No Movie advance screening, despite it being just a week out from its release, so should be ready. Not even a sampling this time, like the last two movies... I'm really hoping that the empty Saturday Night will have a last minute addition of the Movie screening. - My preferred Pre-Con tour is on Thursday, which means fighting to get into the Wednesday Custom Class (which is the more popular one and always sells out first). - We get a bit more backstory to this year's story, suggesting a raiding of Cybertron by a band of "pirates" led by post-Rebirth Scorponok, and repelled by the "Knights of Cybertron". - collector pins (one for first-day registration, and one for Golden Ticket holders)... 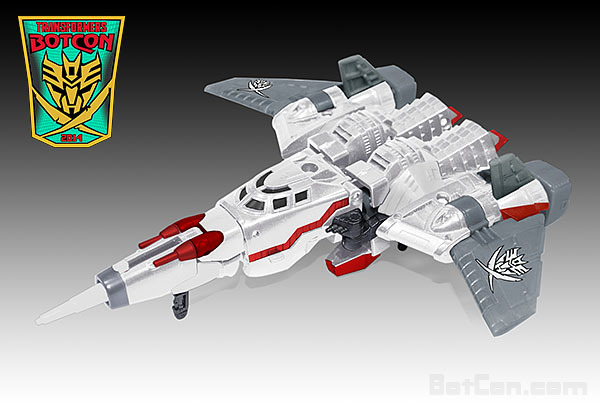 I think this was one of the "GIJoe" Convention elements (looking like military patches or medals) that FunPub are sticking to for their rigid BotCon format. But is it really something people care about, or even notice. It feels like a redundant frill for BotCon, and an expense that could be spent elsewhere at the Convention (like exclusive accessories). - "Each Exhibitor booth will receive one surprise bonus figure." This was on previous Brochures, but I never picked up on it before. I might have to find out what it is (it is likely to be the attendee figure, but I was under the impression that Dealers got a Boxset with the purchase of their booth... maybe I was mistaken about that). - no Construct-Bots segment of the Art Contest, which was something the Hasbro people said last year that they were interested in doing this year. - Six Flags Rollercoaster park again. What's wrong with Disneyland? 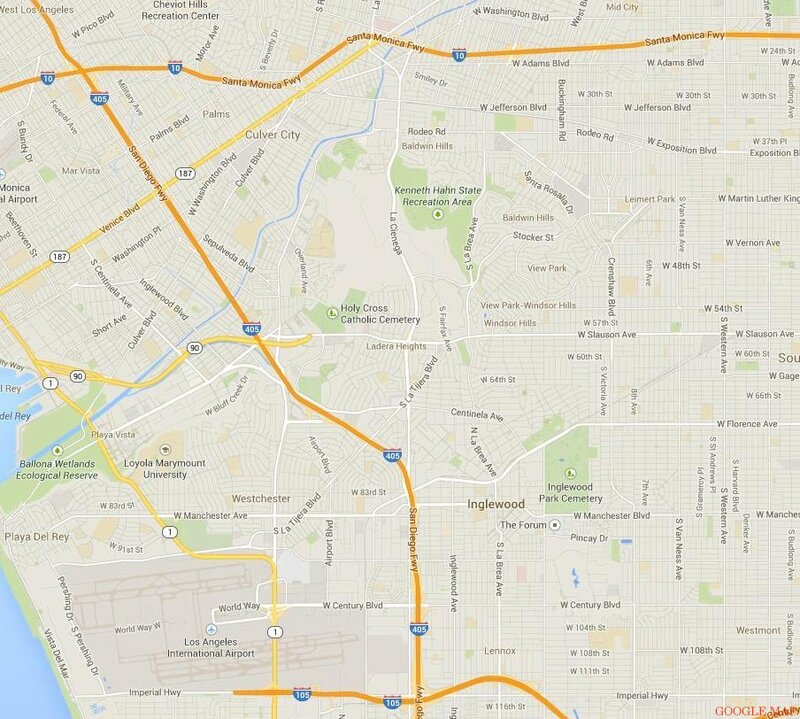 Of all the years in Pasadena, they've never had the most famous themepark in California. I've been to it myself, but would much rather go there than Six Flags (and it is would be closer too). But I'm neutral with this, because if I want to get into a Custom Class I have to hope that there are NOT two good pre-Con tours (as I'd have to sacrifice something). 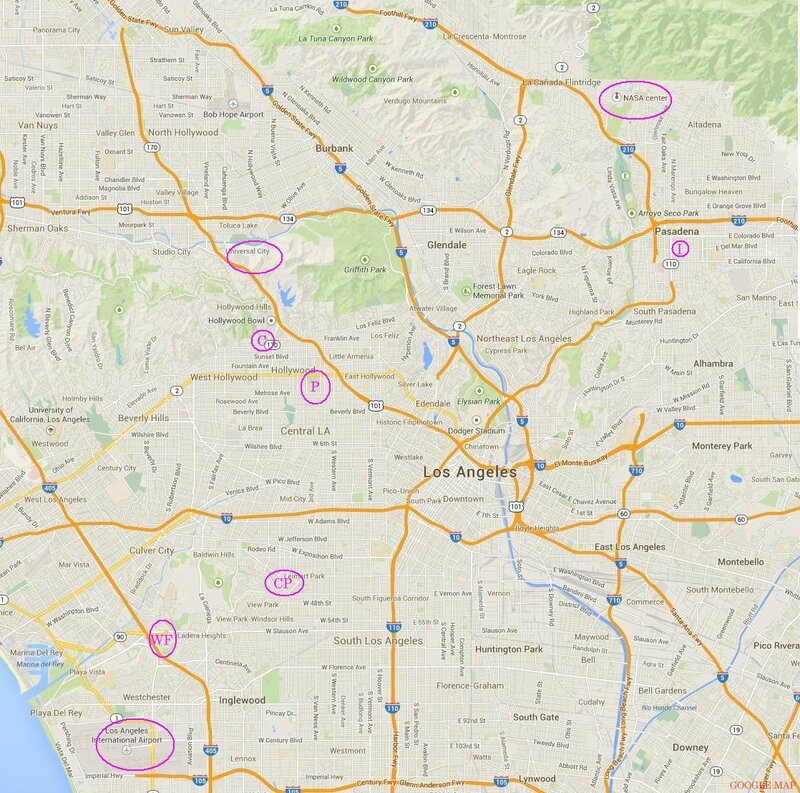 - No hint of an IDW tour from IDW yet, which would need a whole day to go to San Diego and back. If one is offered this year, it's not likely to be before Wednesday... and even if it is, most people will already have travel booked to prevent it, or have other things planned on that day. I'll be aiming for the Custom Class on Wednesday, and the LA Tour on Thursday.... as I've been to Six Flags (the Wednesday tour), and don't have an interest in going back. But Wednesday Custom Class always fills out first... sometimes before the news breaks on fansites that Pre-registration is up. I get there Monday (morning) so will probably toyhunt on the way to the hotel (by taxi), and then maybe do a hollywood tour on Tuesday. I then leave the following Monday (night), but might not plan to do anything on the Monday, in case I get up late or have news/photo posting to do (and depending on if I have to checkout early, or staying with someone who isn't checking out that day so that I can take my time to pack and leave). Ultra Marginal/Dallas is interested in the Warner Brothers Tour I'm doing on Tuesday (and later signs up to), and in turn suggests a NASA JPL tour, which he later books for the both of us... and it is free. (The pirates are) bound for Cybertron! But Cybertron is not defenseless. Noble, wise, and loyal to the cause, the KNIGHTS OF CYBERTRON are steadfast in their protection of their homeworld. Any villainy that dare threaten the planet will be met with valiant courage, unwavering will, and Cybertron’s greatest warriors! – A smarmy, charismatic pirate leader, who rules through charm and subterfuge, rather than force and intimidation, Cannonball is a Bot who’d sooner talk his way out of a fight or into a prize, but is more than capable when he needs to do battle. 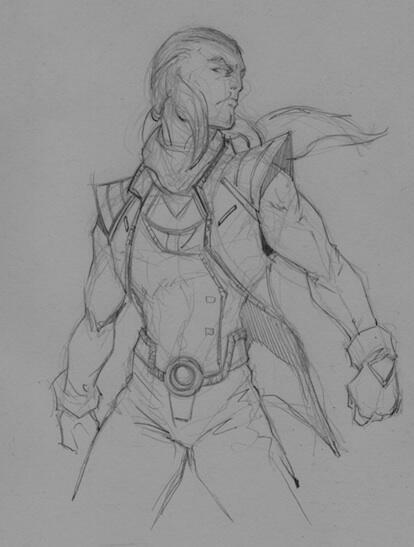 While he specializes in deception, fraud and even out-and- out impersonation, Cannonball is also skilled with blades and melee weapons – a true swashbuckler. – Ferak is a sadist and the Pirates’ maintenance man. He keeps the ship together and can cobble Engines of Terror for casting fear on their victims. He used to be part of an elite Decepticon team called “Squadron X” during the war, but has found adapting to peacetime rather difficult. 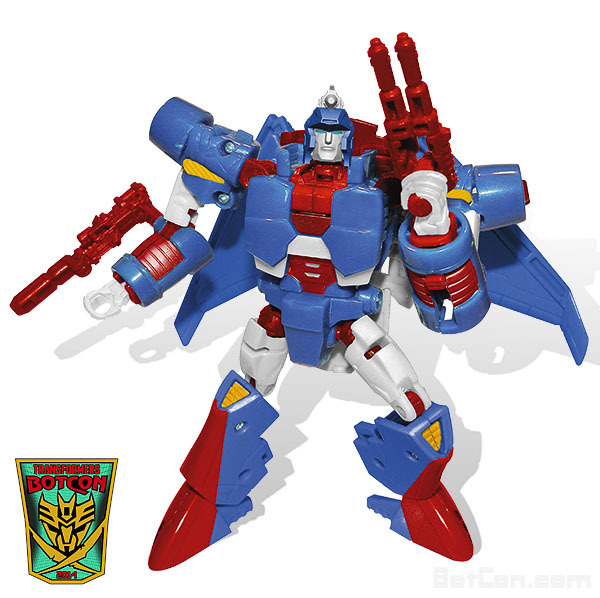 He is partnered with the diminutive TORNADO, a former member of Squadron X, whose alternate mode is a gun, but an ill-designed gun that jams and threatens to explode if a round of ammunition becomes lodged (it happens a lot – Ferak has the powder burns to prove it). – Scorponok is the fusion of machine and a Nebulan named Zarak. 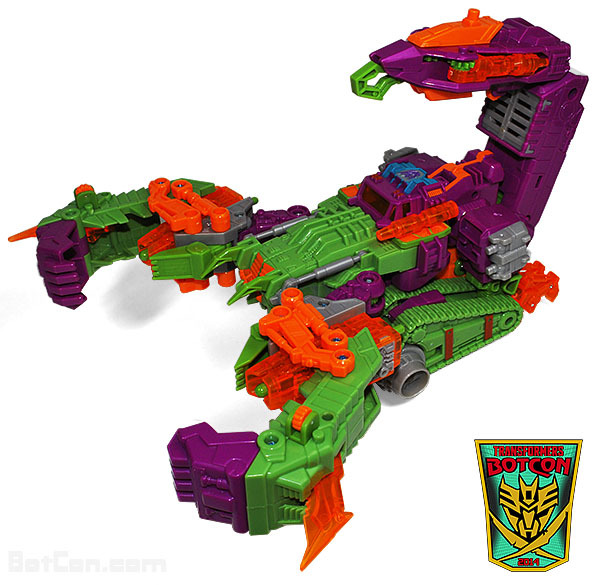 Last we had seen of Scorponok, he was flying through space serving as the battleship for the tattered remains of the Decepticon army. 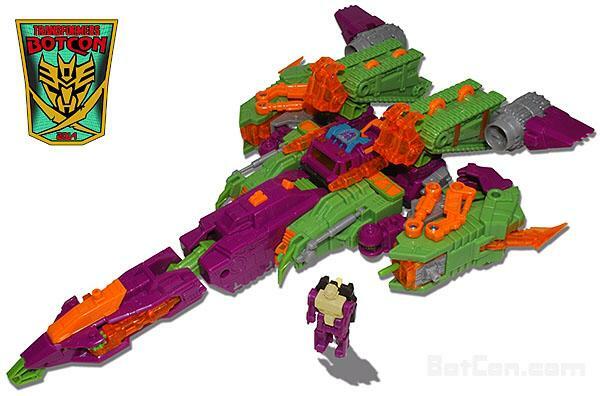 Now, however, Zarak has been forced to scuttle much of that battleship, rebuilding Scorponok into a smaller body. 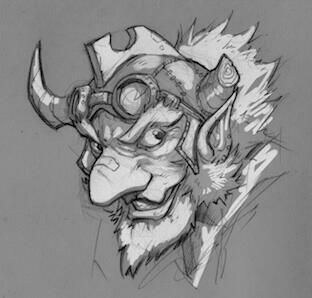 – He is the gruff, pragmatic and downright paranoid military leader of the Autobots/Maximals. 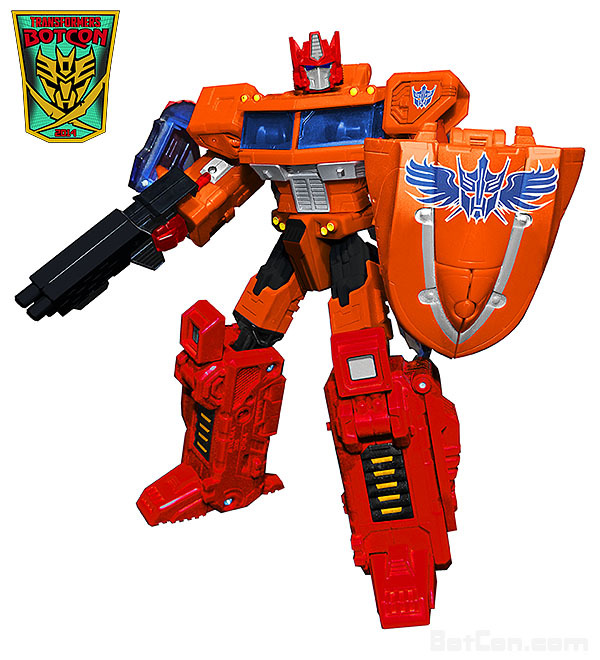 An old-school warrior “Bot of Action”, Ginrai has earned the rank of Knight Commander. A veteran of the old conflicts, he’s not entirely comfortable with the peace, constantly waiting for the “other shoe to drop”. – A loner and former bounty hunter who holds the rank of Knight Sergeant, Devcon is the Batman to Ginrai’s Commissioner Gordon – the Bot willing to cross the line, bend the rules, shake down an informant. He doesn’t play well with others, but he gets the job done every time. 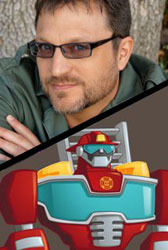 Most of the main cast of Rescue Bots is returning this year... which was probably the most entertaining panel last year, with the VAs playing off each other. 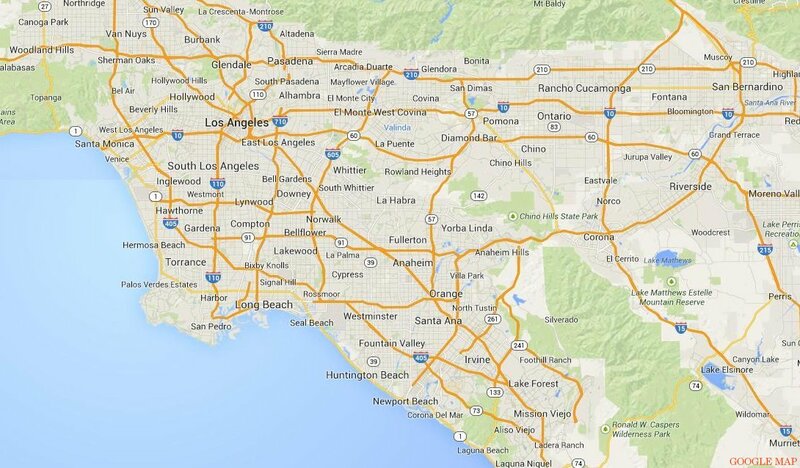 Not surprising, since the show is in LA and many of them probably live there to do their recording work. And since they were so entertaining (I think Rescue Bots should be checked out by older fans), I'm not complaining about the recycling of them two years in a row. The only problem is that they were treated as an ensemble, instead of as individual VA guests for the convention. So, they weren't part of the Golden Ticket reception, and weren't promoted individually like the other VA guests. 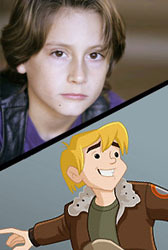 Hopefully they earn a status this year of individual, head-lined Voice Actors. Boxart is revealed, and a tweet to say pre-registration will not be today. 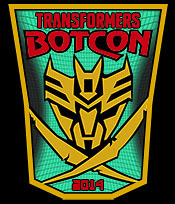 Five hours later (still 90 minutes before Registration begins), they release images of the BotCon T-shirt for this year. Email confirmation 80 minutes later. The Thursday Custom Class appears to have sold out within the first hour, and before the Wednesday one, which would be a first (people usually try to be the first with the figure), so maybe the drop in interest in BotCon has affected the amount of days people are willing to be there (only going for 4 days instead of 5). I wanted to wait for my approval email before trying to get another set, but it looks like they ran out before I got my email. The invoice numbers suggest that about 230 people registered in the first hour, but the "invoice numbers" were sometimes not properly generated in previous years... but it was interesting to note that after the first hour and loose sets had sold out, there wasn't too many people posting on the global fansites to say that they had just registered. I think it means that Scorponok probably is the driving factor this year, so once the scalpers got their share, the "loyal" attendees didn't amount to much more than a couple hundred. 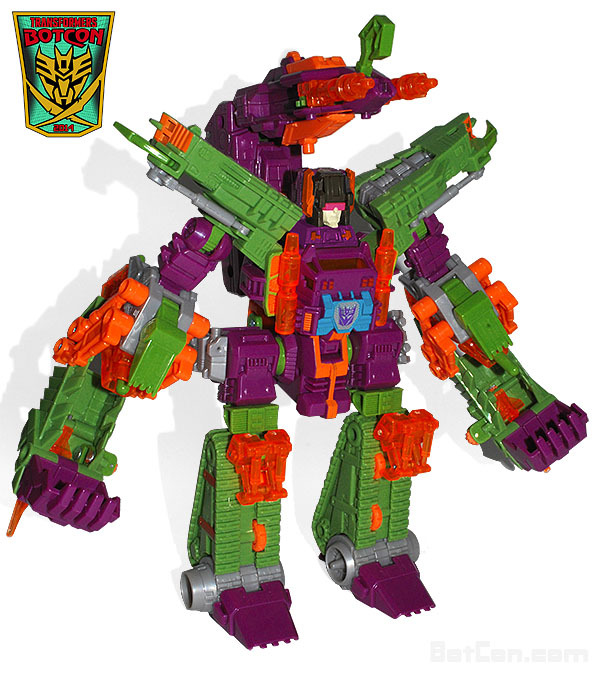 I think the boxset will sell out after the non-attendees are given access, so am expecting people to charge a minimum of $200 for Scorponok as soon as they all sell out. - About a dozen left of the Golden Tickets, from their 100. Since 2012 only had 75 GTs, and last year had 100 available like this year, they must have sold less than 85 last year, as they are claiming to have sold more this year than both previous years. - Loose sets are sold out, but for some reason they have some still available for the remaining Golden Tickets (a secret perk it seems - to have sets reserved for GT purchases). - Thursday Custom Class is indeed sold out, and there are only 7 seats left for Wednesday, meaning 113 seats sold already. - 50% of the Primus packs are sold, but we don't know how many there were to start with... or how the actual number compares to previous years. - They boasted about being on track to outsell last year, but that was expected, being a movie year, being in LA, and having a very popular figure in the boxset (Scorponok). Last year had a bad location, an ordinary boxset, and nothing too significant for the year... so I think it would have been more surprising if they weren't selling more than last year. Some comparative stats from the last 8 years. 1st Announcement - 2007 (31 Dec), 2008 (28 Nov), 2009 (25 Dec), 2010 (23 Dec), 2011 (26 Jun), 2012 (7 Dec), 2013 (12 Dec), 2014 (25 Dec). Convention Friday - 2007 (29 Jun), 2008 (24 Apr), 2009 (29 May), 2010 (25 Jun), 2011 (3 Jun), 2012 (27 Apr), 2013 (28 Jun), 2014 (20 Jun). Time Difference --- 2007 (6month), 2008 (5month), 2009 (5month), 2010 (6month), 2011 (11m), 2012 (4.66m), 2013 (6.5m), 2014 (6month). First toy reveal --- 2007 (?????? 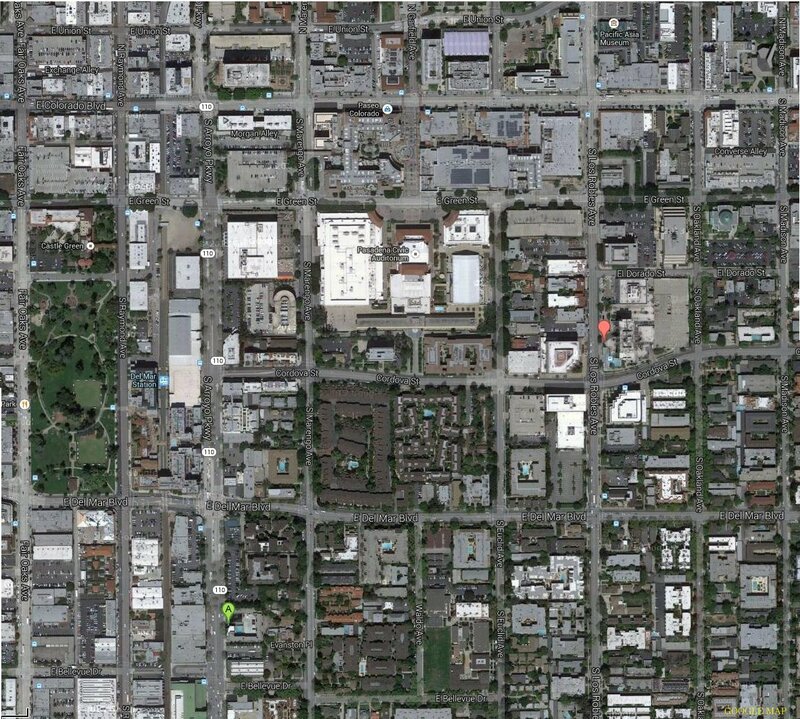 ), 2008 (12 Feb), 2009 (25 Feb), 2010 (23 Mar), 2011 (28 Jan), 2012 (2 Feb), 2013 (1 Feb), 2014 (11 Mar). Time to Con Friday- 2007 (?????? ), 2008 (2.5m) , 2009 (3month), 2010 (3month), 2011 (3.5m) , 2012 (3.75m), 2013 (5month), 2014 (3.5month). Brochure out ------ 2007 (31 Mar), 2008 (27 Jan), 2009 (21 Feb), 2010 (17 Apr), 2011 (20 Mar), 2012 (25 Dec), 2013 (27 Feb), 2014 (24 Apr). Time to Con Friday- 2007 (3month), 2008 (3month), 2009 (3month), 2010 (2month), 2011 (2.5m) , 2012 (4month), 2013 (4month), 2014 (2month). Registration ------ 2007 (31 Mar), 2008 (31 Jan), 2009 (25 Feb), 2010 (19 May), 2011 (21 Mar), 2012 (6 Jan), 2013 (14 Mar), 2014 (10 May). Time to Con Friday- 2007 (3month), 2008 (3month), 2009 (3month), 2010 (1month), 2011 (2.5m) , 2012 (3.66m), 2013 (3.5m) , 2014 (1.3month). 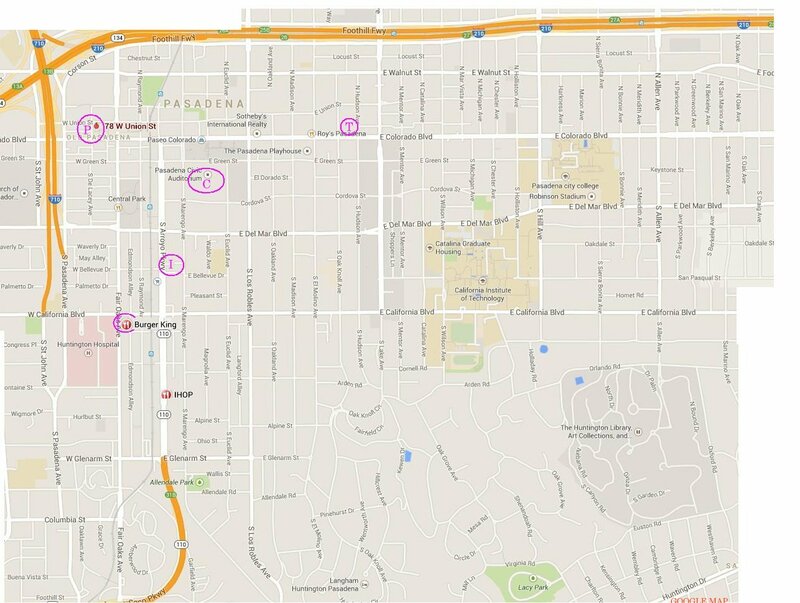 Location of Con -- 2007 (Rhode Is), 2008 (Ohio), 2009 (Pasadena), 2010 (Florida), 2011 (Pasadena), 2012 (Texas), 2013 (SanDiego), 2014 (Pasadena). The Convention is a week earlier than last year's, but everything since the announcement was 1.5 to 2 months later than last year. If something is going to be part of the pre-registration/convention package but is holding up the brochure and pre-registration, they should just make a note that something is planned for the Friday Night, but just can't announce it until it is confirmed. It might not help sell the convention as much as they wanted, but at least people can start pre-registering two months ago, and if the event ends up being awesome enough to promote, it will gain extra attendees if the Primus Packs haven't sold out by then. But waiting so last minute for everything to be approved so that it can be promoted, means less people able to attend. It's not going to stop people from attending at all if Pre-registration is done early and the highlight event is announced later that is within the Convention timeframe (Friday to Sunday). That becomes a bonus for those who pre-registered early, and is an incentive for those who didn't if the packages haven't yet sold out. FunPub don't leave anything in the tank to rope in extra people after registration starts (leaving them with either sold out in a couple days or never selling out), or to make attendees feel like bonus items keep getting added. I remember BotCon 2004 was adding new guests right up until the convention, which just made it more exiting as it got closer to the event for those already registered. FunPub have released their preliminary list of people who have bought Artists tables for the Dealer Room's "Artist Alley", which includes a number of people who have worked on official projects (but some regular big names are missing (Khanna & Milne)). 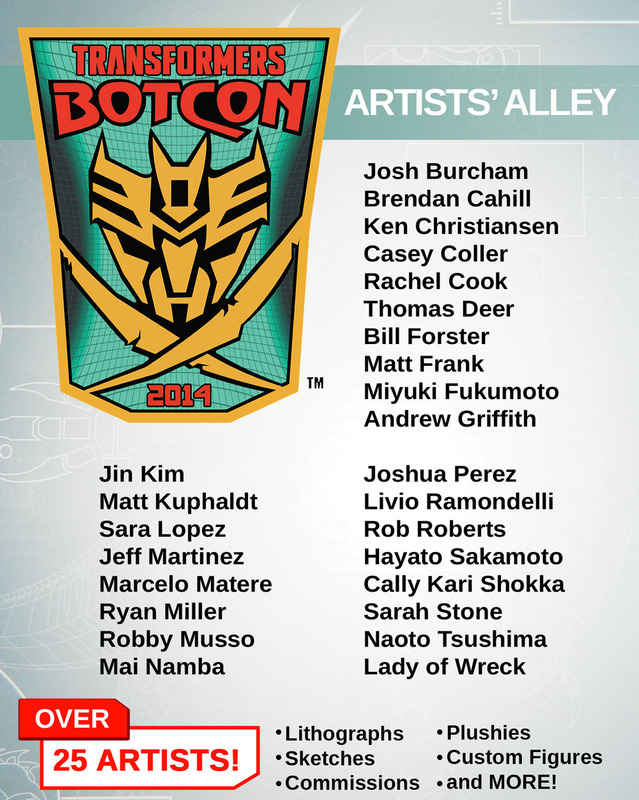 I think these are the current & recent IDW artists on the list - Josh Burcham, Ken Christiansen, Casey Coller, Bill Forster, Matt Frank, Andrew Griffith, Marcelo Matere, Robby Musso, Joshua Perez, Livio Ramondelli, Sarah Stone. I like the idea of the Artist Alley, but maybe FunPub should start noting the ones who have worked on official projects (maybe have them note their "resume" on their registration form), so that we can be enlightened as to who worked on fan-favourite projects that may not be well known or obvious. It's not to put down the amateurs at Artist Alley, as many of the "professionals" started out as amateurs at events like BotCon. Non-attending registration now opens up for those wanting boxsets who aren't going to the show. Some loose sets were set aside for this, but sell out with hours. Just 18 hours after the email saying it was open, they send out an email to say that they are already sold out... but since they still have so many attending boxsets still unsold, they would move some across later, to give people more time to sign up to the convention as an attendee. 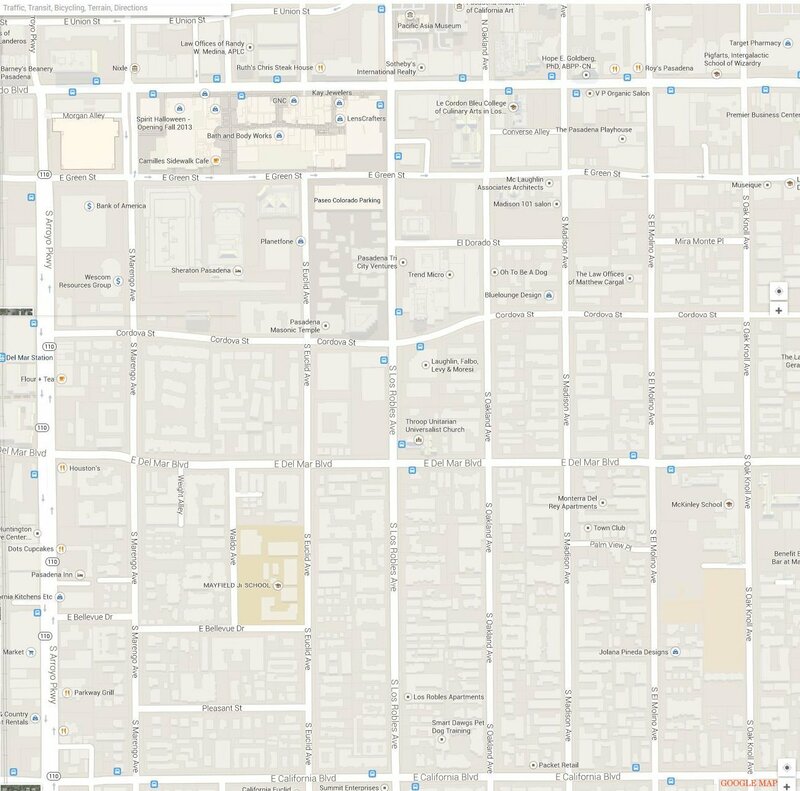 UltraMarginal/Dallas suggests some other Movie Studios tours, which I didn't even think about but should have... so I look at doing Paramount and/or Sony pictures. Still willing to do a baseball game with Dallas (a keen baseball fan), but only if it is on a free day that isn't my first day there (because I'll be too tired). These were the five Australians who said they were going at this stage, but the last two either didn't go, or didn't want to meet up, as we didn't see them there. Not a bad number compared to the last two years, which only had three Australians attending at each (Texas & San Diego). Looks like the Hall of Fame concept is continuing this year, as a number of American sites have been invited to participate. At the convention, it is likely to be something similar to last year, with just a simple announcement of the winner at the Hasbro panel. FunPub announce that they moved more boxsets to the non-attendee pile, because they are struggling to sell the attendee sets this year. Cut-off for registration will be June 4th. A day before the cut-off they announce that they are almost sold out of boxsets. No idea on the numbers going to attendees and non-attendees, and they won't reveal it. It seems that the Universal Studios event on June 20th is not just for BotCon attendees... as tickets will be on sale for anyone to attend the after-hours events and activities. The program is said to have a Hasbro panel and a Stan Bush concert, along with some of the rides staying open for those extra 3 hours (after the park closes at 8pm), but no mention of a sample or advance screening of the Movie. A new image of Devcon is released, apparently of the final product. 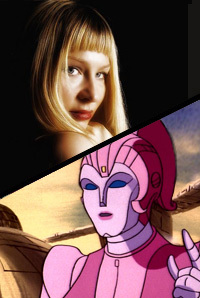 Also announced today, another guest has signed up at the last minute - Morgan Lofting, who voiced Firestar and Moonracer in the Original Series. 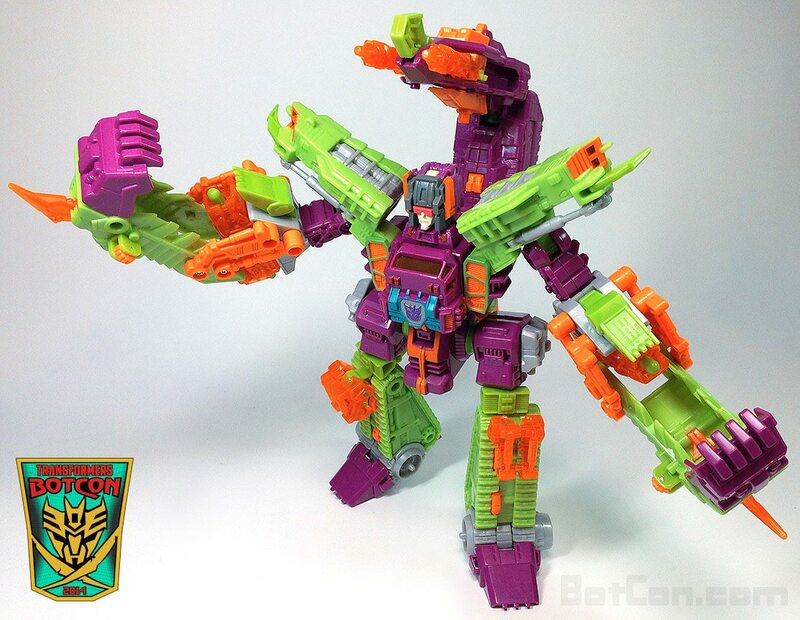 Some images of the actual Scorponok toy are also released, showing off their new Zarak figure. The schedule of events was released, to help attendees start planning the events and timings. Only one panel on the Friday, plus the Fan Film-fest... as everything was brought forward three hours to accommodate the Universal Studios visit. 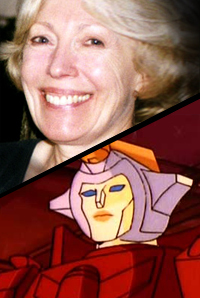 Saturday night only has a BotCon retrospective presentation and MSTF (with the Golden Ticket dinner/reception). The Universal Studios after-hours event had better be worthwhile, to make up for no dinner even this year. The dinner is really the one "adult" element of the Convention each year that I look forward to, to give a real spectrum of atmospheres to the convention... which will be one thing I'll probably miss most this year. Also announced, Hasbro will be giving away a free Deluxe size toy to the first 150 children who are on general admission (walk-ins). 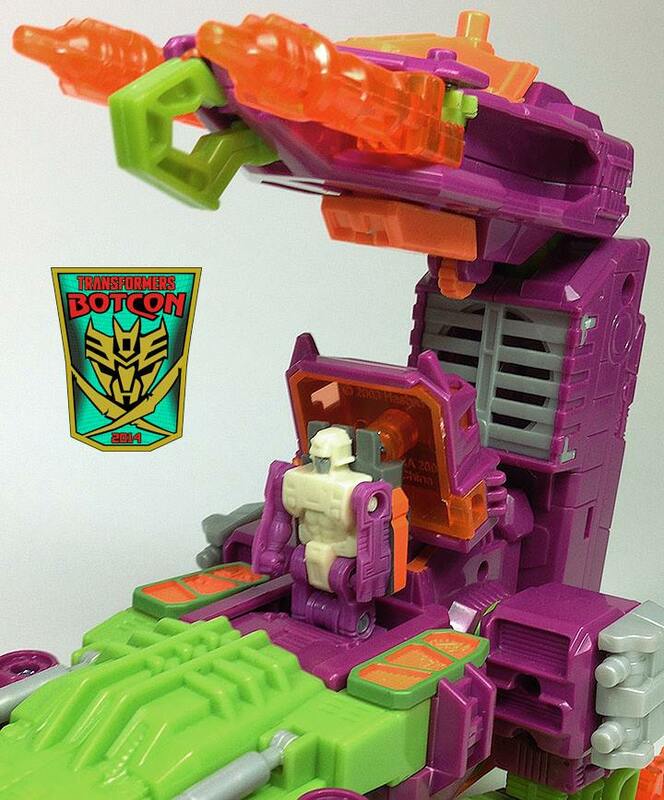 A leaked list of BotCon toys and a couple show up on ebay, end up giving away almost all of this year's at-show figures before the Convention... once again, defeating the point of keeping secret over half of the toys. The first Convention activities start in one week's time. 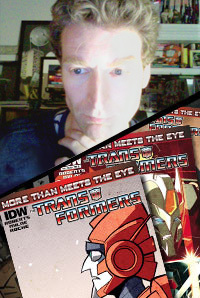 A BotCon exclusive comic of MTMTE #30 is revealed. It was solicited by some online store who had the Optimus/MLP comic last year, but this time there are two... to be sold at BotCon, and then later on their site if any are left. 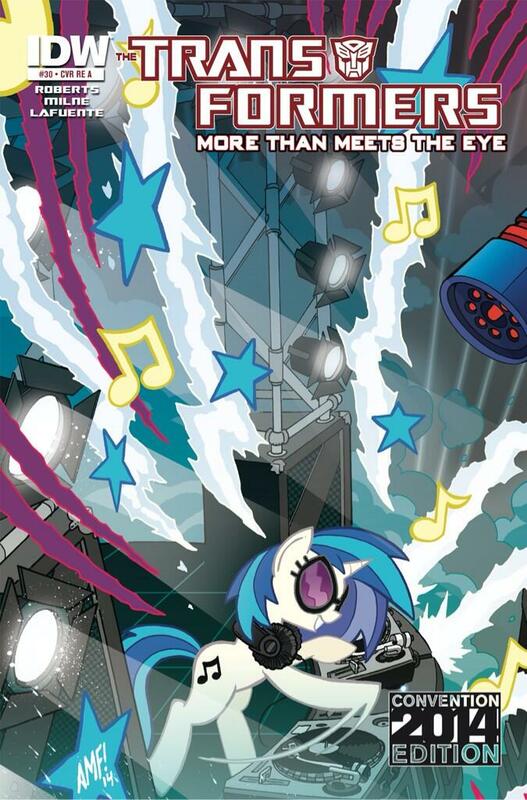 There are 600 of each, and the two covers combine to form a music battle between Gen1 Soundwave and.... the My Little Pony character "Vinyl Scratch". (I found these in the Dealer Room, but unfortunately, the person running the Toy Worth Booth was not one to trust, as you may have read on my Intro page in the "Bad" comments). A Press Release about the Universal Studios Fan Event, revealing that the Hall of Fame winners would be announced on that night. 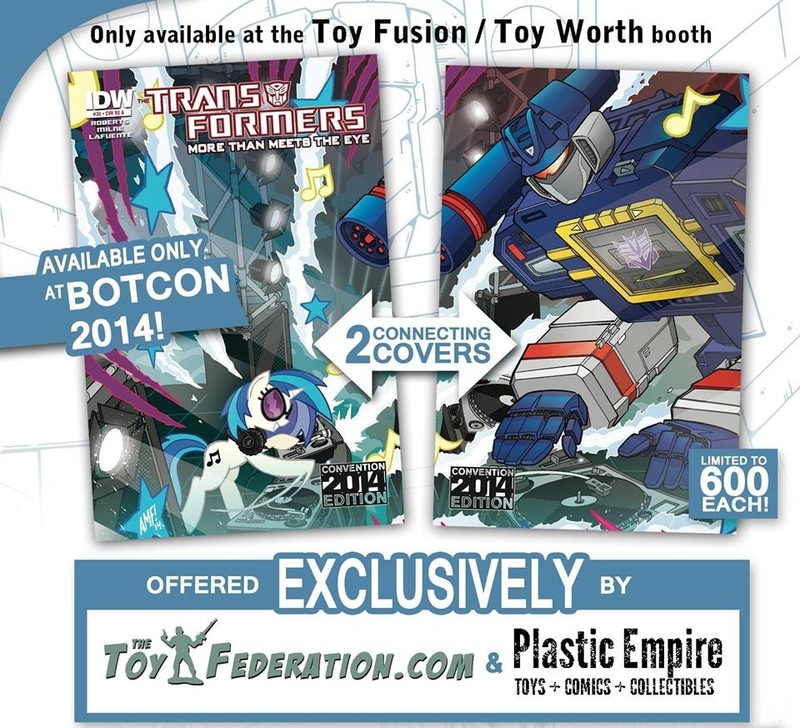 The Cost is for non-BotCon attendees, as the full package attendees had it included. When: Friday, June 20th from 3:00 p.m. to 11:00 p.m. 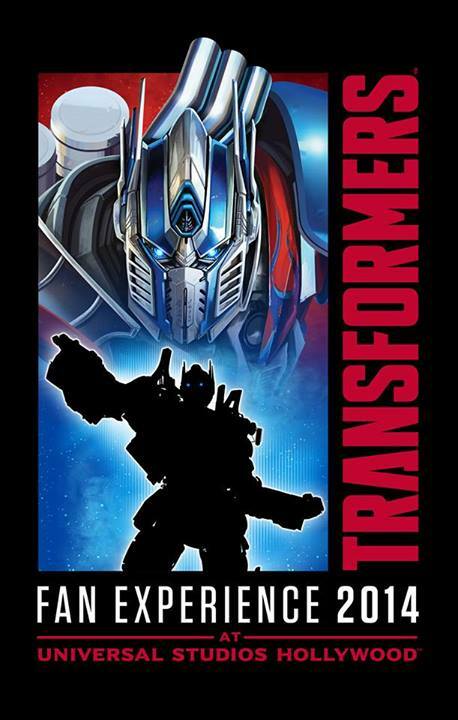 Cost: $75, includes admission to all rides and attractions, in addition to the breakthrough thrill ride, “Transformers: The Ride—3D,” as well as after-hours access from 8:00 p.m. to 11:00 p.m.
Commemorative event lanyard, free limited edition memorabilia poster (while supplies last) and 10% off select merchandise. I finally got the maps finished that I'll be using... which others here can utilise if they want, if anything is applicable to you. 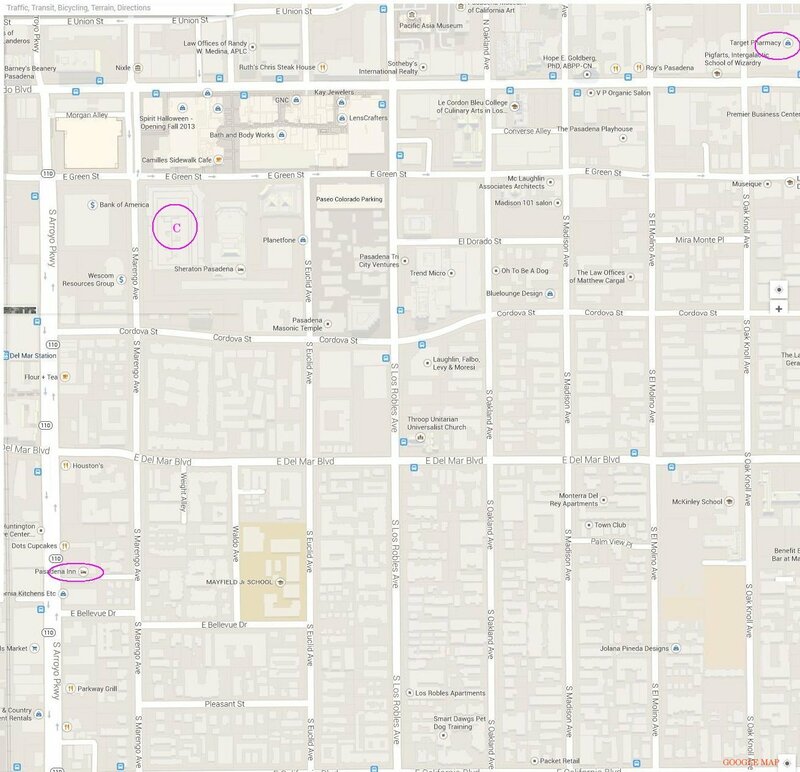 Most maps are in pairs - a clean one, and one with things noted or circled. 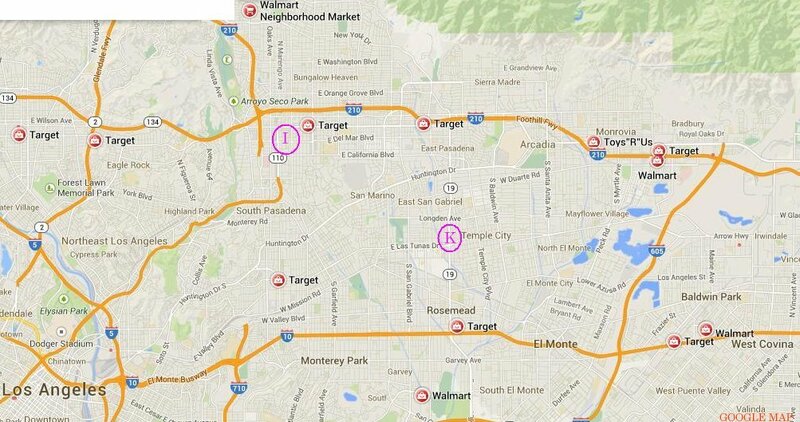 I have included major retailers (Walmart, Kmart, Target, ToysRUs), some food places I am interested in, and the various tour places I have planned. 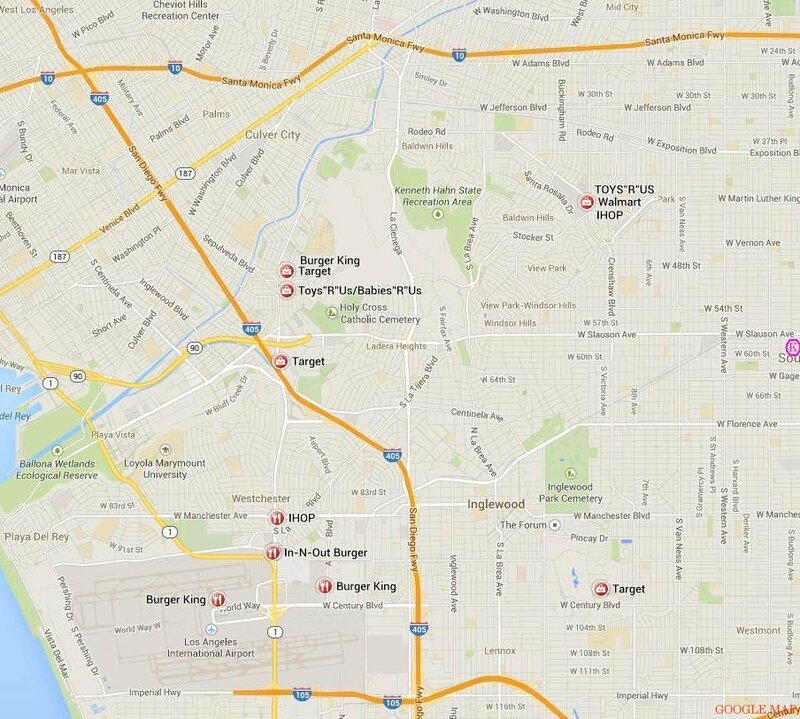 LAX to Crenshaw Plaza - second one has locations noted. 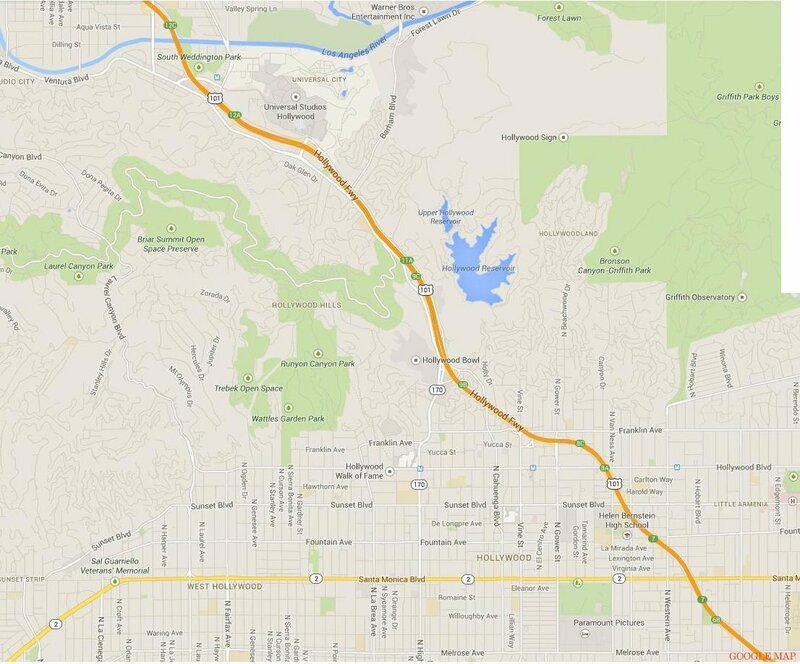 The "Earth View" of the Pasadena area, showing the three main hotels (Sheraton, Hilton (green), Inn (red)). That's it... the rest is covers the actual adventure. ***All pictures in this convention report are mine except - Maps are from Google, and BotCon official images are from the BotCon Site. Others will have the source credited/noted. If you want to use/borrow any of my photos, all I ask is for you to please credit the source as well. I take as many photos as possible, and will only resort to using others if I failed to get something important, or my photo wasn't clear enough.